The anniversary of Steven Spielberg’s Jaws has come and gone and in the ensuing years, big-screen shark flicks haven’t shied away from the myth of the shark as a relentless killing machine and natural man-eater. Sharks aren’t necessarily deserving of the image, especially since the shark is now poised to save human lives. 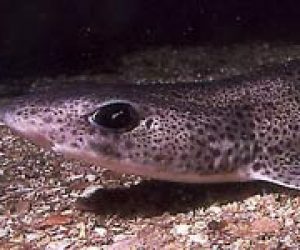 The lowly dogfish may be providing new ways of controlling cancer. Throughout the sharks’ bodies are important chemicals that the animals need to function normally. These chemicals include steroids, gastric juices and hormones that help them do everything from digesting food to healing wounds. Many scientists are now investigating whether these compounds have any potency in the human body. One chemical, known by the commercial name Isolutrol, has proved to be extremely good at drying up pimples without affecting skin elsewhere on the body. It was originally found in shark gall bladders but scientists are now trying to synthesize the compound in the lab. The project is a joint effort between Australia’s Commonwealth Scientific and Industrial Research Organisation and New Zealand’s McFarlane Laboratories. So far however, the sharks seem to be guarding the secret to the molecule, and a commercially viable version of Isolutrol is as yet out of reach. Acne sufferers aren’t the only ones interested in sharks; cancer patients may stand to gain from shark research as well. A chemical from the belly of the dogfish is turning out to be a promising treatment for some forms of cancer, at least in the initial trials. Dr. Michael Zasloff, an adjunct professor at the University of Pennsylvania School of Medicine and co-founder of the Magainin Research Institute, discovered the chemical squalamine while on a hunt for antibiotic compounds in various animals. He first found antibiotic properties in the skin of the African clawed frog, and then began searching other animals for more compounds that could prove useful to humans. 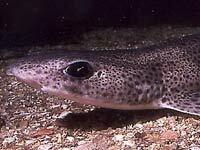 In one previously unstudied class of dogfish named Squalus acanthias, Zasloff found a molecule that appeared to prevent cartilage from calcifying and becoming hard in an injured animal. 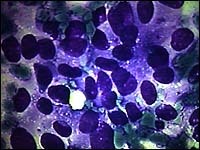 The chemical, which Zasloff named squalamine, was extracted from the dogfish’s liver. It proved a dud at stopping bacterial infections, but it was surprisingly good at halting tumor growth, in original tests conducted on animals. Squalamine seems to disrupt the ability of cancer tumors to create new blood vessels. This effectively prevents them from growing and spreading to other parts of the body. Squalamine might be part of future chemotherapeutic regimes. As a result of the animal study’s promising outcome, squalamine is now in second stage human trials for the treatment of solid tumors. “As a consequence of all our animal studies, we believe that squalamine, when administered with a standard chemotherapeutic regimen, can control tumors (in humans) that right now cannot be controlled,” Zasloff says. The animal studies included lung cancer, breast cancer, prostate cancer, ovarian cancer, and melanoma. Ultimately, Zasloff hopes squalamine might be used to control all of these cancers and, perhaps, many others. Magainin Pharmaceuticals, where Zasloff still serves as a scientific consultant, has also started clinical trials with squalamine as a treatment for Fibrodysplasia Ossificans Progressiva (FOP), a rare genetic condition in which the body makes extra bones in locations where bone should not form. It could be in you too It’s no fluke that a steroid found in the guts of one species of shark should have such a strong effect in humans. In fact, Zasloff says, this chemical is almost certainly already being produced and used in the modern human body — and those of most other modern animals — though he suspects it is only really used when we are in the womb. But since this chemical compound plays an important role in the immune system of sharks, as it appears to, it ought not to be a surprise that it could do the same thing in humans. “The chances of that chemical not being in man — or not being in the frog, not being in the mouse or in any mammal — are essentially infinitesimal,” he says. Unfortunately, for both us and the sharks, the number of sharks and shark species are dropping yearly, thanks largely to fishing. But Zasloff has a warning: He says we are only just now beginning to realize the enormous medical bounty offered to us by sharks and it’s happening at a time that shark species are disappearing at an alarming rate. Thanks to commercial fishing during the 1980s, dogfish numbers dipped to a historic low in the late 1990s. At the same time, many other species of shark and their relatives — such as Canada’s barndoor skate — are disappearing almost without notice. Zasloff says the loss of each individual species to the medical and scientific community is immense. “There is one steroid in the dogfish, for example, that has powerful effects on appetite in mice, dogs, monkeys, and so on. But we don’t know if the same collection of chemicals are present in other sharks.” To Zasloff and other medical researchers who are looking to the animal kingdom for cures to major human diseases, each of the planet’s 370 species of shark is a treasure to be protected. Remember that, next time you’re at the movies and the heroes are about to end up as a delicious shark smorgasbord for a great white. After all, these animals just might end up saving your life one day!